Before the house was built, Joel Ferree owned the land. 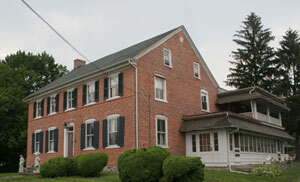 The house was built by John Adam Lightner and his wife, Leah Ferree Lightner. Leah was the daughter of Joel and great granddaughter of Madame. A date stone (no longer there) is documented to read "Built by Ferree and Lightner 1795". "Almost Paradise Crafts" is now located on this site.